Steam showers are the modern day equivalent to the steam baths of ancient Rome and the traditional Finnish saunas. Historically, wet steam baths have been used for cleansing, relaxation, and detoxification, as well as a social or spiritual activity. In fact, most cultures have a tradition of some kind of steam room, such as Native American sweat lodges and Japanese mishiburo, dating to the 12th century. Warm, moist air opens the pores, increases blood pressure and stimulates the sweat glands. Hot steam relaxes muscles after a workout and opens bronchial passages in asthma sufferers. It cleans the skin of impurities through the pores and can be more beneficial and less aging than soap and water. Hot steam is even said to improve the immune system because it tricks the body into thinking it has a fever and therefore stimulates the body’s natural defenses. Nearly anyone can partake of a steam shower, although a few groups should refrain or seek the opinion of their medical care provider. Those include people with high blood pressure, diabetes, or circulatory problems. It is advised that young children and pregnant women also refrain from taking a steam. When in doubt, consult a medical professional. Is a steam shower feasible for you? In today’s modern bathroom, steam showers are relatively easy to install or retrofit. A steam shower is basically a small, enclosed shower space, with a steam generator to boil water and release its vapor into the stall. Connected to the building’s plumbing, the generator can be installed up to twenty-five feet away from the shower itself. The generator's power is based on the size of the space it services and should provide a temperature control to avoid scalding. Modular units may be retrofitted in an existing bathroom with minimal construction, replacing a standard bathtub. These units, generally fabricated from acrylic, include the steam mechanism, vapor-lock door and shower heads. Some even come with a jet tub feature. A custom steam shower is designed when the bathroom is built and is finished with stone or tile walls, floors and ceilings which should be mortar based, not drywall mounted. Doors are fully sealed to retain the steam. 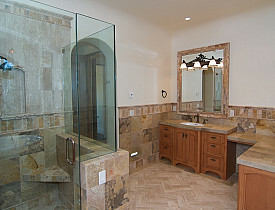 Many amenities are available, such as rain shower showerheads and massaging jets. At the super deluxe end are “steam suites,” which can accommodate from two to ten people and include aromatherapy, jets for all body parts, media hookups for entertainment, and mood lighting. Patti Johnson, CID, IDS, of Patti Johnson Interiors in Columbus, Ohio, installed a steam shower as part of a gut remodel of her own master bathroom. The new steam shower included two separate showerheads at different heights to accommodate Patti and her taller husband, in addition to opposing jet sprays for a 360 degree experience. A wraparound bench seat for two was built in underneath the steam sprayer. The thermostat was installed inside the shower and the steam controls installed outside, adjacent to the door for easy access. Two vent fans were installed to help disperse the steam as quickly as possible. How much does a steam shower cost? Unlike a standard shower which can use up to fifty gallons of water in twenty minutes, a steam shower will use as little as two gallons in the same time period. It does consume more electricity, however. Steam shower installations start at about $1,500 (plus labor) for modular units to upwards of $20,000 for the deluxe multi-person steam experience installations. But then, if you have one of those, you’ll never have to leave home to go on vacation again. Eeeewwww! Sewage Overflow in Basement!